On this page we offer SOBRAL and EMILY RAY JEWELRY at super discounts! R. Sobral's jewelry is bold and large, a look he has been making in Brazil since 1994. But Carlos Resende Sobral started making jewelry in 1976, the first time he saw polyester resin...he now makes his jewelry with a polyester resin, recycled no less! The colors are vibrant, layered or dropped or swirled. Other found items may be tossed in. Every piece is unique, the larger pieces are lighter than similar-sized stones or pure glass. Sobral has several of his own shops in Brazil and Paris, his jewelry has won awards in both jewelry markets. Emily Ray jewelry is made in South Carolina using Swarovski® crystals and Swarovski® pearls, with interesting stones and glass beads worked into special designs. Some of the crystals used are made exclusively for Emily Ray! We offer finished jewelry, plus the Hoopla interchangeable charm jewelry. Save if you buy more than a single charm! These ear charms are made of Swarovski crystal 8mm cubes with a rhinestone rondelle accent, with a top loop to hang from Emily Ray sterling silver hoops. Wear them as singles, a matched pair, or mix colors. Available as listed. 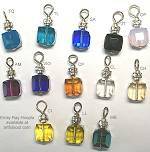 SOLD IN SINGLES (one charm), you must buy 2 in order to make a pair. 1-3/16 x 5/8 inch faceted bullet shapes form earrings that are dramatic in their illusion. Clear resin has a black&white stripe in the back, it is magnified and seen at different angles. Brass post located 3/8 inch below top edge. These ear charms are made of Swarovski crystal 10mm rounds with a rhinestone rondelle accent, with a top loop to hang from Emily Ray sterling silver hoops. Where them as singles, a matched pair, or mix colors. Nugget shape looks like it came off a meteor. Resins are clear and silvery gray with silver glitter inside, the glitter is subtle. About 1-1/8 x 5/8 inches, brass post 5/16 inch below top edge. 1 inch circles of clear resin are domed to show off the bits of recycled metallic foil inside. The foil colors include silver, gold and copper, sometimes with a hint of patina. Dangling from copper earwires (not recommended for sensitive ears, or easily change to another earwire metal), 2-1/4 inches long. We offer Emily Ray's Hoopla interchangeable jewelry! Dangling charms of Swarovski® crystals and pearls work with various shapes and sizes of hoop earrings, you can pick your charms and hoops, swap them around! Also available are Swarovski® necklaces of pearls and crystals to coordinate with the earrings, even hang your choice of charms from the necklaces or silver chains. Individual components available in our La Jolla shop...but we offer some beautifully coordinated sets here too! Black resins hold a stripe of black&white stripes (position of row in each piece will vary). Bangle is 1-1/4 inches wide, rounded outer edge up to 3/8 inch thick. Medium size 2-5/8 inches inner diameter. Teeny Swarovski pearls in light bronze color dance along a sterling chain in delightful cluster style, 1-1/4 inch long on sterling leverback earwire. 7/8 inch multicolor pop art stripes, with bright orange dominating, in flat square earring. CLIP ON style for all ears. Hoopla system includes necklaces with pendant charms too! 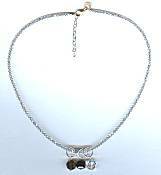 8mm Swarovsky crystal cubes with small rhinestone rondelle, hang from small ring from necklace (available seperately). 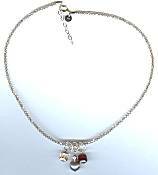 Or hang from your own sterling chain if it has a small clasp that will let the charm loop over it. These ear charms are made of Swarovski 10mm rounds with a rhinestone rondelle accent, with a top loop to hang from Emily Ray sterling silver hoops. Swarovski pearls have a crystal core and pearly smooth finish, they will wear better than pearls! Where them as singles, a matched pair, or mix colors. You choose how to put them together, or mix with other sets! Emily Ray jewelry features Swarovski® brand crystals and pearls. These are easy to maintain as they have leaded crystal base for shine and strength, but can be chipped as they are essentially glass. The faux pearls have inner crystal core for nice weight, and are resistant to scratches and body oils (unlike real or other faux pearls!). The components are so durable, Emily Ray offers a lifetime guarantee! Read about what others think of R. Sobral jewelry! Instead of reviews for a specific product, this is a place to share about the designer line in general. Read about what others think of Emily Ray jewelry! Instead of reviews for a specific product, this is a place to share about the designer line in general.